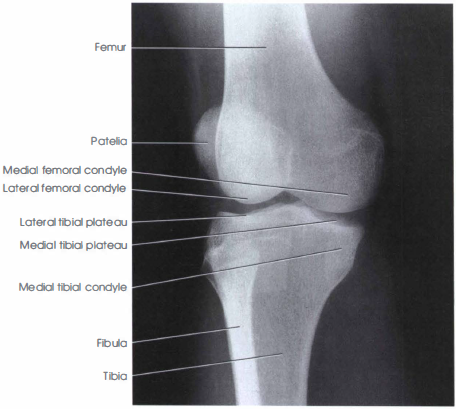 Pathology involving the proximal tibiofibular and femoral (knee) joint articulations is demonstrated, as are fractures, lesions, and bony changes ralated to degenerative joint disease, especially on the anterior and medial or posterior and lateral portions of the knee. Note: A common departmental routine is to include both medial and lateral rotation oblique projections for the knee. If only one oblique is routine, it is most commonly the medial rotation oblique. 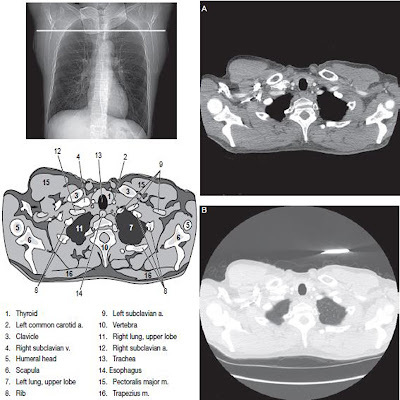 Take radiograph with patient in the semisupine position with entire body and leg rotated partially away from side of interest; place support under elevated hip; give pillow for head. If needed, stabilize foot and ankle in this position with sandbags. Direct CR to midpoint of the knee at a level 1/2 inch (1.25 cm) distal to apex of patella. Collimate on both sides to skin margins, with full collimation at ends to IR borders to include maximum femur and tibia-fibula. Note: The terms medial (internal) oblique and lateral (external) oblique position refer to the direction of rotation of the anterior or patellar surface of the knee. This is true for descriptions of AP or PA oblique projections. Distal femur and proximal tibia and fibula with the patella superimposing the medial femoral condyle and shown. The lateral condyles of the femur and tibia are well demonstrated and the medial and lateral knee joint spaces appear unequal. The proper amount of part obliquity will demonstrate the proximal tibiofibular articulation open with the lateral condyles of the femur and tibia seen in profile. The head and neck of the fibula will be visualized without superimposition, and approximately half of the patella should be seen free of superimposition by the femur. CR and center of the collimated field is to the femorotibial (knee) jont space. Optimal exposure with no motion should visualize soft tissue in knee joint area, and trabecular markings of all bones should appear clear and sharp. Head and neck area of fibula should not appear overexposed. Excellent post. This article is really effective and helpful. Thanks.